Mitchell gaming table by Coaster Furniture. 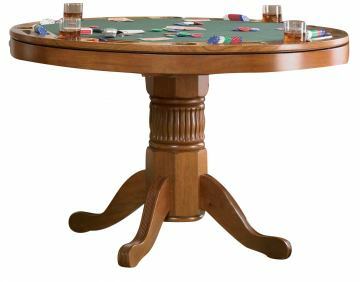 With highly functional and fun designs, this three-in-one game table will make a great addition to your home. Relaxed style is demonstrated with the delicate curves and charming carved detail in the pedestal base. The finished table top allows you to enjoy a casual meal or sip on your morning cup of coffee. Flip the top around and you will find a 42" dark green felt lined card table with cup holders and chip trays. If poker isn't your game, this piece transforms into a bumper pool table and includes pool sticks and balls!